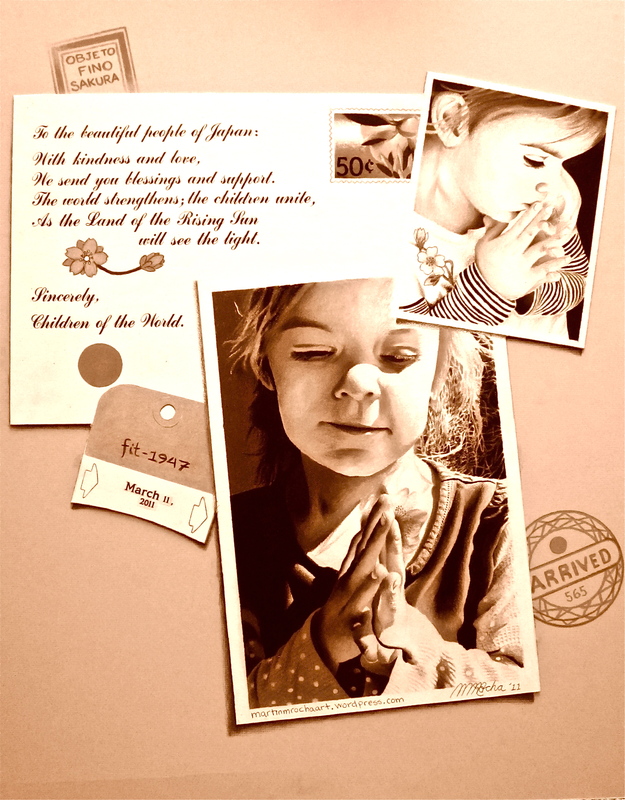 JAPAN : Martin M. Rocha Art’s “Sakura / All for Japan” donation. 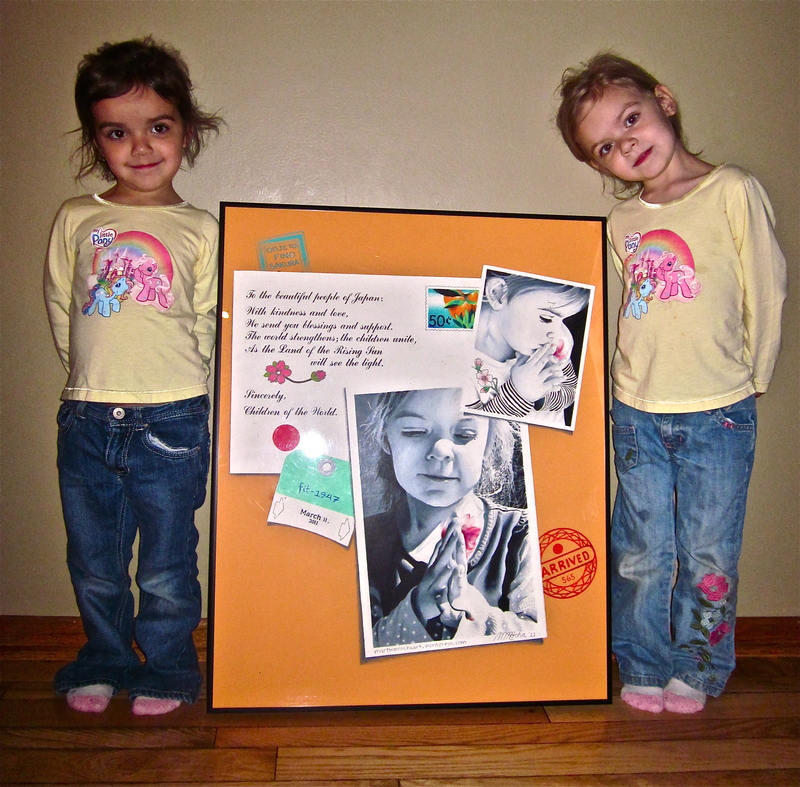 I took the time to take pictures of my latest art work with my two inspirations. It was a joy putting this project together as I made the idea and vision a reality! Satoko was very welcoming in accepting the donation for the project and took the time for some photographs to be taken. It was an honor to meet her. 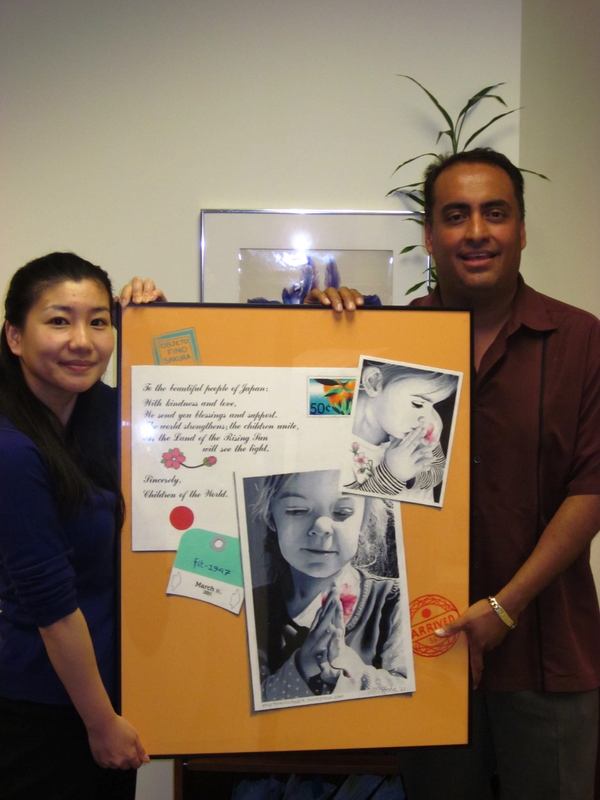 “Sakura / All for Japan” was a special gift from the heart, a donation for the beautiful people of Japan. It was an emotional experience at the Japan Consulate in downtown Chicago. Thank you to my friend Becky as well. I would like to thank all the Art fans and friends out there for making the “SAKURA / ALL FOR JAPAN” possible; mission accomplished, delivery complete! But specially Hailed, Mike, Becky (For the adventure / specially at the gas station) and most of all my friend Suzann (Thank you for your guidance, advice and direction). It made a difference to work on such a special art project that came from the heart; a piece of art work that means so much for all of us and to the people of Japan. 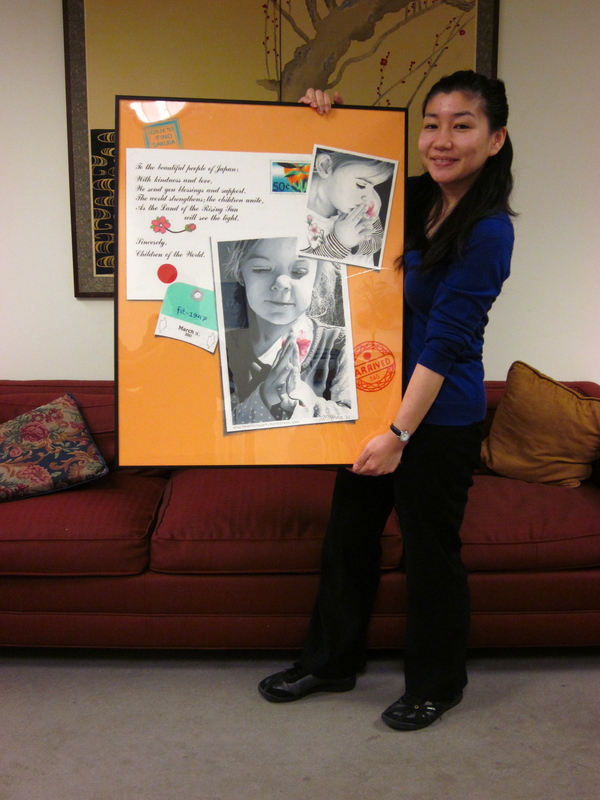 The final photograph of "Sakura/All for Japan"
Arrived : May 13th 2011. Don’t forget that passion in the art is truly in the details. Any comments that you may have, contact Martin M. Rocha at martinmrochaart@gmail.com. Don’t forget to also visit us on Facebook, Twitter and Pinterest. My apologies for not getting back to you sooner in re to your donation of your beautiful art piece in re to the Japan Earthquake. We just had our morning meeting, and we would be delighted to accept the donation here at the Society. If possible, we would like to use the piece as an auction item for both our Annual Golf Tournament in August and/or our Annual Holiday Fundraiser on December 15. All proceeds help to support our Society’s programming and educational endeavors. Please note that our office closes at 5:30 PM on Friday, so please feel free to stop by anytime before that time. For our own internal purposes, do you know what the value of the piece is? 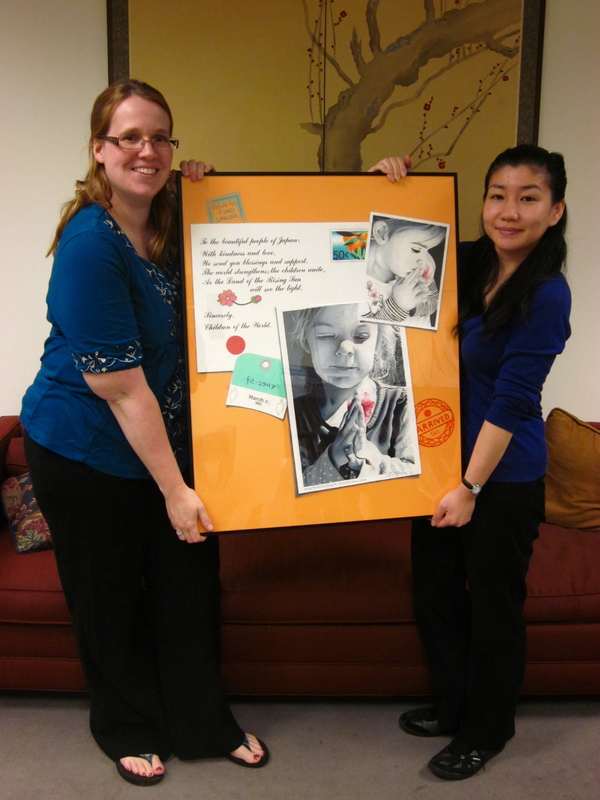 Thank you so much again for thinking of our organization and the people of Japan during this difficult time! Erica Kono wrote this beautiful email on May 11th, Exactly when the events occurred . After speaking with her on the phone she accepted the donation a couple of days later. I am very happy to see that the masterpiece is going to a good cause. It was my pleasure and honor to be part of this special moment as it unfolds emotions of joy and happiness. Erica was kind and very welcoming, but was unable to attend when I arrived, but I had the opportunity to meet Satoko Ogi who was very welcoming as well. After taking several pictures and a few tears and smiles we parted ways. This entry was posted on May 15, 2011 by martinmrochaart. It was filed under Art by Martin M. Rocha, Art for Charity and was tagged with amazing art, art, Art and culture, Art and Japan, art blog, Art for charity, Art for Japan, Art work by Martin M. Rocha, artistic drawing, Artists and donations, Artwork inspired by black and white photography, Artwork using colored pencils, Black and white drawings, blogs about drawing, Blogs about Japan, Blogs about Japan of March 11, blogs that review art, blogs that review art websites, Charity artwork, Donating art work, drawing, Drawing for Japan, Drawing from photographs, Drawings of children, inspiring artwork, Japan and Sakura art, Martin M. Rocha Art, new art blog, new artists, Sakura art.